Learn more about Race in America. W.W. Norton respects your privacy. Visit the showcase site for Race in America. A preeminent sociologist of race explains a groundbreaking new framework for understanding racial inequality, challenging both conservative and liberal dogma. Assembling the most provocative, productive new thinking on race in one volume. A groundbreaking approach to thinking about race and racism today. Matthew Desmond and Mustafa Emirbayer, authors of The Racial Order, have written an undergraduate textbook on race relations for the twenty-first century. 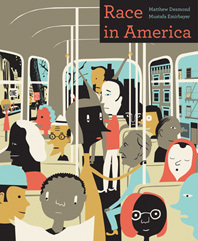 Every chapter of Race in America examines how racism intersects with other forms of social division—those based on gender, class, sexuality, ability, religion, and nationhood—as well as how whiteness surrounds us in unnamed ways that produce and reproduce a multitude of privileges for white people. Featuring a table of contents that is organized around race and racism in different aspects of social life, Race in America explores the connections between individual and institution, past and present, and the powerful and the powerless. Today’s society is confronted with problems of racial division that are, in some ways, far more complex and ambiguous than those of straightforward segregation, bigotry, and the civil rights struggles of the 1950s and 60s. From exploring intersectionality by looking at the social forces turning hip hop away from—or toward—its political roots and providing thoughtful consideration of how students can participate in the fight for equality and freedom, to incorporating a critical analysis of whiteness without leaving white students feeling guilty or persecuted, Desmond and Emirbayer provide an effective language for discussing and addressing the multifaceted problems of race and racism in today’s society. Chapters are structured around the many and varied social spheres in which racial dynamics operate, from education and politics to work and intimate relationships. Topics explored include racial polarization in American politics; the ways in which poor minority families are challenged by stagnant incomes, lack of housing assistance, and rising housing costs; and various explanations for why the majority of poor Americans are white even though African Americans, Hispanics, and American Indians are more likely than whites to be poor. Race in America is accompanied by a wealth of tools to help students retain and synthesize information. “The Big Picture” concept maps integrate key terms, learning goals, and “From Theory to Practice” activities into visually compelling study resources that serve as pre-reading guides as well as post-reading reviews. InQuizitive is an adaptive learning tool that personalizes quiz questions for each student in an engaging, game-like environment to improve understanding of important learning goals outlined in each chapter of the text. Instructors can create the perfect book for their course by mixing and matching chapters from Race in America and adding their own collection of readings from a database of more than 200 selections. Norton’s sociology readers and trade books keep costs down while enlivening a course with outside readings.